South Korea’s Hyundai Development Company (HDC) said on Thursday it held a ground-breaking ceremony for a general hospital of Bangabandhu Sheikh Mujib Medical University or BSMMU in Dhaka, Bangladesh. The construction project led by the national medical school would create the country’s first hospital specialized in intensive care of critical disease. 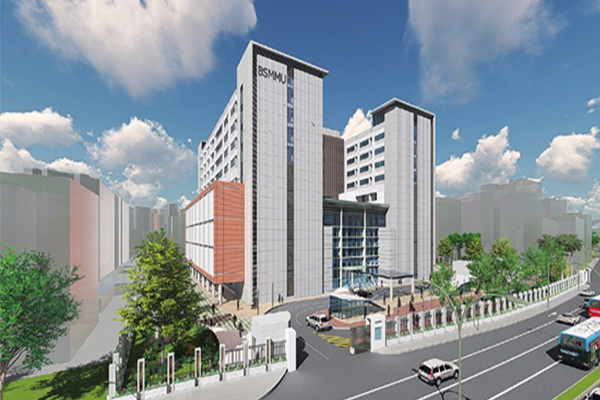 The 9-story building with a total floor area of 52,890 square meters will have 700 beds and a heath care service system, which will be the largest one in the country. The project will be financed by the Korean government’s economic development cooperation fund. It also marks the largest official development assistance (ODA) project in the area of hospital construction. The Korean builder has amassed technology and honed its capabilities in hospital construction by building many major hospitals including Asan Medical Center. HDC also said it will establish a Bangladesh office to explore business opportunities there. HDC has been in stable business even in high-risk overseas construction markets, which are marked by its successful milestones recently in Bolivia and Vietnam.